Jesus entered our world in the most normal of ways for a child: the time came, his mother gave birth, he was wrapped in soft cloth, and placed in a crib. Only this was the Son of God who was born. 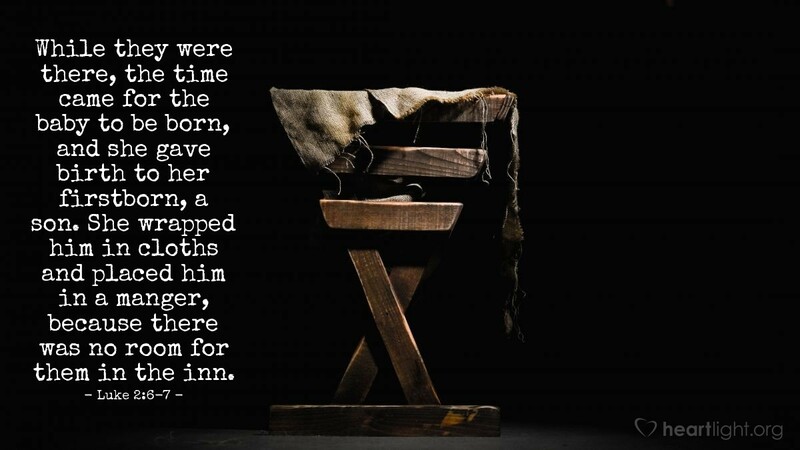 His crib was a corncrib where animals ate, not a baby's crib. His room was a stable because there was no room for him. It wasn't just normal; it was common, even below average conditions for his birth. Can you imagine? The Holy God who created everything enters our world as a baby to share our way of life as one of us. Why? He loves us and wants us to come home to him. Incredible! Incredible story. Incredible love. Incredible God! O LORD God Almighty, how can I ever show you how much the gift of your Son means to me? I am struck with wonder and joy that you should love me in this incredible way. Please accept my praise and adoration for both you and your Son. Praise to you, loving Father, for your indescribable gift! In Jesus' name. Amen.